My confidant and closest friend is in Atlanta – if you have any interest in food in that town, you’ve heard of Linton Hopkins. 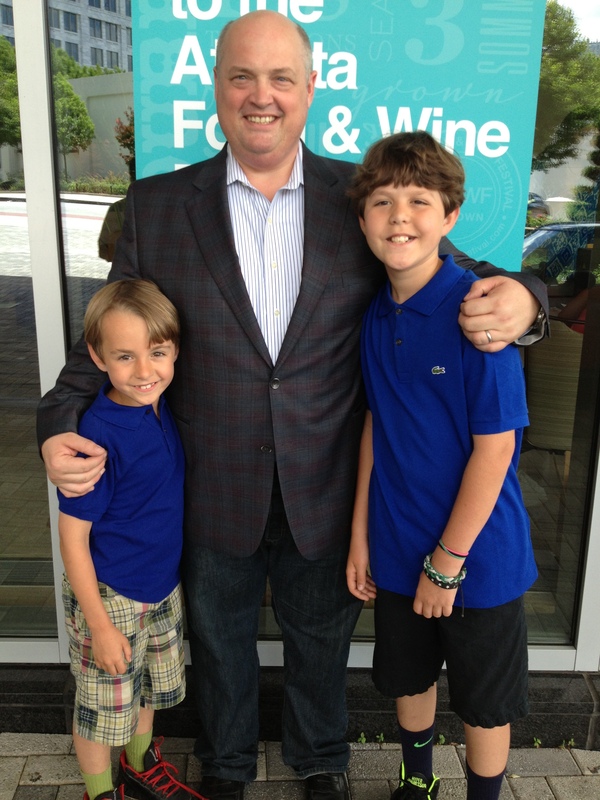 We’ve both gotten so busy with restaurants and families of our own in recent years, that what I most look forward to about the Atlanta Food & Wine Festival is my annual in-person visit with Linton. We’ll carve out three or four hours of the 72 I’m in town to catch up on a year of lost time. 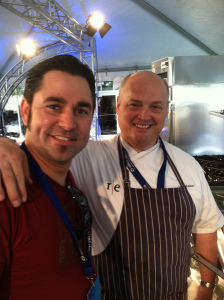 The camaraderie among us chefs [or “Brutha” as we commonly refer to one another as a term of endearment] at the Atlanta Food & Wine Festival is hard to put in to words. Amongst all the chatter in the Loews Kitchen on the 14th floor, you’re more likely to hear “hey brutha” than “hey chef.” I don’t want to sound like a curmudgeon, but most of us simply don’t have time for a whole lot of new people in our lives these days. But when we’re together, even if we’re strangers, there’s a common ground among those of us who work at this 24/7, and a level of understanding and shared experience that exempts us from talking about work. We can get closer faster, if we’re so inclined. When I’m in a ‘normal’ social situation, say, around my own neighborhood or at a local get-together or watering hole, I’m the ‘designated chef’. People want to talk to me about food – and that’s cool. But if I were to walk in to the VIP lounge at the Festival and start raving about how amazing the first radish of the season is, they’d all look at me like I had three heads. There’s a freedom there that allows us to be ourselves, and just hang out and talk about life. There’s definitely room for a free exchange of information, like sharing newly discovered purveyors and sources, but that’s pretty specific and quick, and then we move on – back to just hanging out and talking about kids, travels and what’s next. It’s funny to think you make some really great friends – ones that are not judgmental, and you feel an instance connection – but you see once a year and it’s at this festival. Some are not even all that far away from northern Virginia, where I live. Daily routine doesn’t allow time to pick up the phone to chat with them, so I’m looking forward to it, preferably over a bourbon or beer. Because the Festival is so well organized, and because the work to be done is stimulating but not overwhelming, it allows for some real downtime. For all the reasons I value the Festival, that may be the strongest. What else am I looking forward to? An Allan Benton sighting would be nice. When he’s at the Festival, it usually means a twenty-minute lecture, then he hops in his car and heads back to Madisonville, Tennessee, because there are never enough hands at the smokehouse. He’s one of our old-school purveyors at the eatery that has raised his craft to an art form, and it’s inspiring just to be around him, whether or not he’s talking bacon. With Linton locked in, and the possibility of a brush with Allan Benton, and the promise of lots of good camaraderie in between, I’ll be ready to get there sooner than later. This entry was posted on May 29, 2014 by Simone in Bayou Bakery, David Guas, SIMONE SEZ and tagged Atlanta Food & Wine Festival, Chefs, David Guas, Linton Hopkins, Southern.